I got myself a couple of mail-related New Year's gifts. (I'll post about the other one soon, never you fear.) My husband saw this in a magazine and convinced me that I would love it, and he was absolutely right! I got mine on Amazon; it is the "Gramata WA8235 House Your Mail-Wooden Organizer" in Walnut stain. I took these photos back in January and my slots are a little more full now, but this is how I keep my mail piles in check. Oversize stuff has to go on the top, but all the little slots mean something in my system. It really is a big help in staying organized. 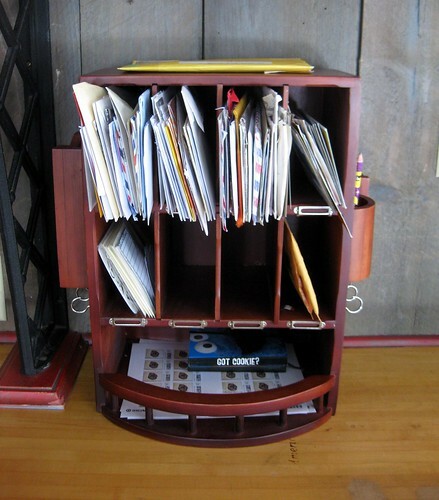 I was skeptical about the size of the slots at first, but most of my mail fits nicely in there. It's attractive and practical; I enjoy looking at and using it. It can be wall-mounted, but I have a nice space near my writing desk where it fits nicely on a counter. It is a few steps away from my writing desk, so it is easy to access, but doesn't take any space away from my actual writing surface. I am wildly enthusiastic about this organizer. It is solid wood, and well-made. I recommend it highly to any mail enthusiast. I decided to leave my slots unlabeled, but you can see the little brass holders for labels (label paper included) where you can denote each slot's purpose or contents. I still have a couple of empty slots, but I know their perfect use will come to me soon. THIS is SO cool! I'm having organizational tool envy! I'm going to look for an organizer like that for my kitchen... I hope I can find one in white... way to go, girl! nice organizer!! i'd love to have one too! 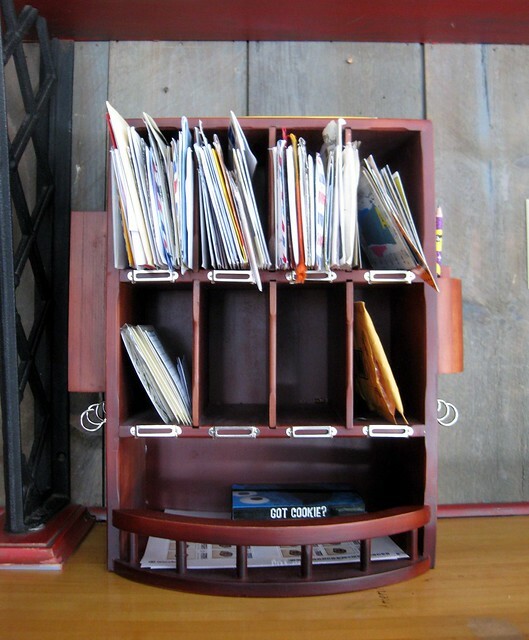 I am completely lusting after that mail organizer!! I love to be organized but find it very challenging with all of my incoming and outgoing mail and all of its accoutrements. I will be looking into this! Thanks so much for sharing. Totally off-subject but I thought you might find it interesting. The Winter/Spring 2011 members' magazine for Historic New England includes an article, "Doorknobs and Letter slots" by Sally Zimmerman that briefly outlines the history of mail service in Boston. The article responds to a reader's question about whether the letter slot on her 1870 home is original. The answer is no, and Zimmerman explains: "Free city delivery was established by Congressional act in 1863 to forty-nine large cities whose post office revenues were sufficient to pay mail carriers to deliver mail to individual homes. Before 1863, postage covered only the cost of delivery between post offices, and the recipient either collected the mail personally or paid a private carrier to deliver it." Mailmen delivering to the homes would hand the mail to someone answering the door, or else would keep it and return later. Letter slots were put on doors to let the mailmen drop off the mail without having to wait. In 1923, all customers were required to have a letter slot or mail box. Eliza, thanks for sharing that fascinating fact! and now..I am in Lust! What a wonderful organizer and now that I am back to my writing ways after being so sick..I think I will have to put that on my Birthday wish list....hmm my Mom was just asking me about that today. I think I might like one of these. 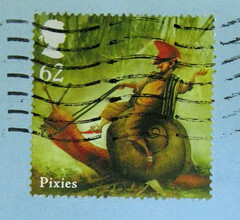 This is beautiful I would love one of these (but I would have to get a lot more mail to make it worthwhile). Oooooo ... it's pretty and it wall mounts! 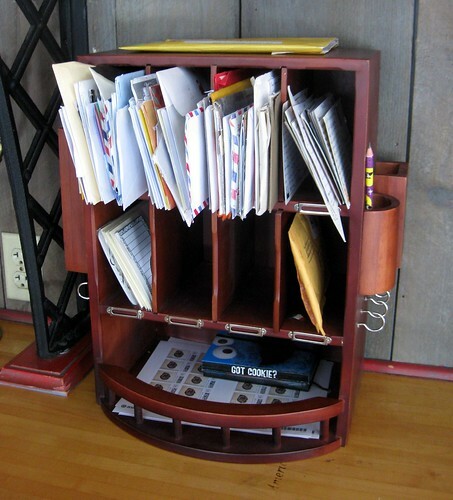 For the folks who say they don't get enough mail to need an organizer, point taken. But allow me to enable for a moment and note that I've now got slots filled with labels, deco tape, stickers, etc -- only the top 3 slots have mail in them right now. It's a great organizer for all the other mail-related things that need a place... but I confess, I have a lot of mail-related paraphernalia as well as mail itself! I love this organizer and may have to get one for myself. Thanks so much for telling (and showing) us about it. Oh my goodness, I just saw the multi-colour pen in your etsy shop! I used to threaten my sister with bodily harm in order to get ahold of "her" rainbow pens, after using up my own! 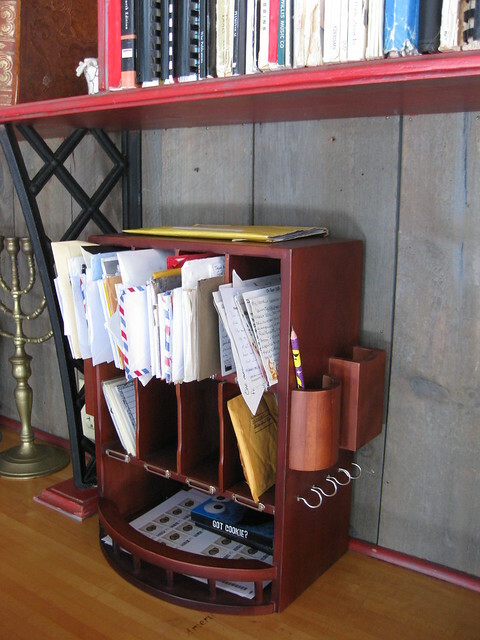 I covet: (1) your organizer, (2) your organization, and (3) your amount of mail!!! Thanks for your note. I've bookmarked your page. I'll have to set up a link list on my blog!